Weimaraner dog incontinence can occur at any age, and there are a number of dog health issues that can cause incontinence. However, even though young dogs can be incontinent, the condition is most common in older dogs. Your Weim may be incontinent due to a simple dog urinary tract infection, or the loss of bladder control can be a more serious condition. In addition, it’s important to note that the Weimaraner dog breed is more prone to some dog urinary dog problems than other dogs. Knowing what to look for, can help you control the problem. Incontinence is an issue, mostly with geriatric dogs. Urinary incontinence is simply the leaking of urine when the dog cannot control it. When this happens, dog owners often get frustrated with the dog, and the dog may end up being taken to the pound. There are a number of medical reasons that your dog can become unable to control her urine. Cystitis – this is another name for a urinary tract infection. Your dog may strain to pee. She may need to go outside more frequently. And she may have blood in her urine. You can perform a simple test at home to see if your dog has a UTI and you’ll have the results in two minutes. If your dog suffers from urinary tract infections, Mighty Max Cranberry and Probiotics chews will cure the infection and prevent a recurrence. Sphincter Incompetence – The sphincter is the muscle that controls the flow of urine out of the bladder. When it can’t completely tighten to hold the urine, your dog has sphincter incompetence. Leaking usually happens when your dog is lying down or asleep. 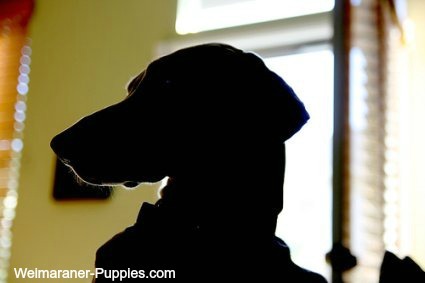 Older female Weimaraner dogs are most prone to this condition. It is treated with female hormones or with a prescription drug call PPA (phenylpropanolomine). Bladder Stones – If your dog has urinary tract stones, she will have the same symptoms as a urinary tract infection. Bladder stones can also cause a bacterial infection. Stones can form in the kidneys, as well. If your dog has kidney or bladder stones, he will need to see the vet. Surgery may be in order for removal of the stones. Diabetes -If your dog has diabetes, he may have a problem with urinary incontinence. Kidney disease – sometimes a cause of leaking urine. Simple urinary tract infection – this can usually be treated with an antibiotic. Urinary incontinence is most frequent in dogs weighing over 40 pounds. 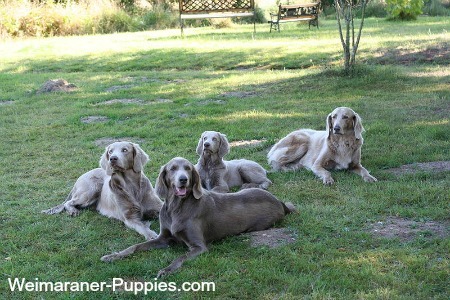 Weimaraners are one of the breeds that are prone to dog incontinence. Frequently mistaken for dog submissive urination, canine incontinence is not a behavioral problem, and it needs to be addressed, medically. Your dog doesn’t even know that she lost her urine. Don’t reprimand her for losing urine. Punishing a geriatric dog that has lost bladder control–will do only harm. It will not resolve the issue! Older spayed females often lose muscle tone, due to female hormones dropping. Your vet can help you with this, as there is medication that can help. If your dog has started to leak urine, take him for more frequent walks. And consider purchasing a dog bed with a washable cover. You can wash it every day and keep your dog’s area smelling fresh and clean. Dog odor – Your dog may have an offensive odor because her hair has been soaked with urine around her bottom. Urine wetness – Your dog may have obvious wetness from urine. If the skin is always wet from urine, skin irritation can develop. Her dog bed is wet or damp – Dogs who are incontinent often lose urine while resting or sleeping. You may notice an odor or dampness on your dog’s bed or where she rests or sleeps. Increased thirst – If your dog is drinking LOTS of water, he may have an endocrine disorder, like diabetes. Urinary tract infections – dogs with incontinence often suffer from frequent infections. Depending on your dog, his age, and the reasons for his incontinence, the treatment may be simple or you may need the assistance of your veterinarian. There are many good incontinence products on the market to help you keep damage to your home and your dog’s discomfort to a minimum, so don’t despair. Urinary incontinence can be caused by a simple urinary tract infection (that will go away), by aging in seniors, or by a serious condition like a tumor. So, before you undergo self treatment for your dog, make sure that you understand the cause of your pet’s incontinence–so that the treatment is appropriate! 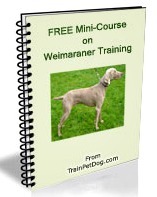 If your Weimaraner is a puppy and has had a few accidents, you probably don’t have to get too excited about it. Your puppy probably just needs a little more attention and a few more lessons on potty training. Puppies cannot hold their urine as long as an adult dog can, so make sure that your puppy goes outside regularly (the same time every day) and frequently. And give your puppy lots of praise when she urinates outside. In most cases, puppies will soon be fully trained, and your dog will gain better bladder control, for longer periods of time. There are various medications and dog incontinence products that are presently being used to treat canine urinary incontinence. The most frequently used drug for treating bladder control loss in male dogs is phenylpropanolamine or PPA. This works to tighten the bladder muscles. If PPA is unavailable, you may also try a synthetic form of estrogen called diethylstilbestrol or DES. Imipramine may also be used a substitute for treating this medical problem. It is an antidepressant that causes urine retention in some patients treated with it.